April 2010: World Heritage Centre mission; November 2010: World Heritage Centre/ICOMOS/ICCROM Reactive Monitoring mission. Between 8 and 11 November 2010, a joint World Heritage Centre/ICOMOS/ICCROM reactive monitoring mission visited the property to advise stakeholders on the overall reconstruction of the Muzibu Azaala Mpanga, to define in collaboration with the State Party, a Desired state of conservation (DSOC) for the removal of the property from the List of World Heritage in Danger, the corrective measures and an implementation timeframe to achieve the DSOC. On 21 February 2011, the State Party submitted a state of conservation report in response to the recommendations of the World Heritage Committee at its 34th session, and on the 30 March 2011 it submitted a revised Reconstruction Strategy. The mission report is available online at the following web address: https://whc.unesco.org/en/sessions/35COM. The revised reconstruction strategy is a much extended version of the one submitted in 2010. It has evolved out of consultations with stakeholders, including the entire community, as well as desk research on specific aspects of the reconstruction, and discussions with the Reactive monitoring mission team. It has been compiled by the National Technical Committee on the reconstruction of Muzibu Azaala Mpanga that was set up to coordinate the implementation of the restoration of the Kasubi Tombs. The Committee is made up of representatives from the Uganda Government, the Buganda Kingdom and the Uganda National Commission for UNESCO. The fire has brought about a strong realisation that there is a gap in knowledge of traditional Ganda architecture, built prior to the colonial era and its evolution in the 20th century. No detailed records exist for the earliest versions of the Muzibu Azaala Mpanga building. The mission notes that there is now a real interest in reviving traditional knowledge and skills, particularly amongst the younger members of the Baganda clans involved in the re-building project. The mission considered there was a need for focused research on the large number of existing tombs and also to gather information that might exist in British and other European libraries. The intangible value of the property is linked not just to ceremonies but also to the knowledge of traditional building practices. 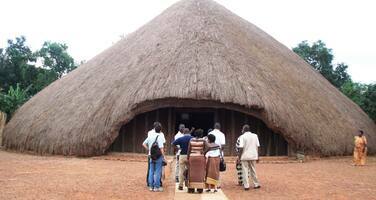 The Muzibu Azaala Mpanga was originally constructed in 1882 and became a Royal Mausoleum in 1884. In 1905, the building was reduced in size because of structural problems related to its very large roof. Further remodelling of the building took place in 1938, and at that time non-vernacular materials were introduced. Concrete supports and steel beams had the advantage to allow more floor space in the absence of a forest of poles supporting the roof. It is argued that any reconstruction of the earlier buildings would be highly conjectural and therefore the mission agreed on the 1938 model to base the reconstruction. It is however also proposed that the apex should be raised to provide a steeper roof, more similar in profile to the earlier buildings, as this would shed the rainwater more readily. An issue that emerges strongly from the Reconstruction Strategy is the key role of the craftsmen with knowledge of traditional construction techniques and building materials. The reconstruction process has fostered a revival of interest in the technical and social facets of this work, which is shared between different clans. The work of the head thatcher and his apprentices, practising since 1968, is now of supreme importance. The mission noted that apart from these thatchers, no other groups of craftsmen held knowledge of historical construction methods and details of material used prior to the 1938 re-building. The Strategy further foresees capacity building activities for skilled workmen including thatchers, decorators, curators, engineers, and architects, to improve the reconstruction process management. Responsibility for the reconstruction lays with the authorities at the highest national level. The reconstruction will be managed by a tripartite arrangement between the Government of Uganda, the Buganda Kingdom, and the Uganda National Commission of UNESCO and will come under the guidance of a Cabinet Committee. The reconstruction will be handled by the Technical Committee. A project architect, a site manager and a site supervisor (who is a conservator), have been appointed. Documentation will be carried out by staff and students from Makerere University (Uganda). The entire process of reconstruction will be recorded, including gathering of materials, and documentation of meetings, ceremonies, and visitor responses. Five traditional bearers from the Buganda Kingdom will be identified and trained to document elements of intangible heritage. This documentation should be compiled in a well illustrated published report, which the mission considered should show the successful implementation of the entire reconstruction process. The mission noted the high vulnerability of many of the remaining structures to fire as a result of faulty wiring and the lack of routine monitoring and maintenance. The Reconstruction Strategy includes a draft Risk Management Strategy that considers the main threats to the overall property. These include besides fire issues, encroachment, dumping of rubbish, lack of regular monitoring and maintenance and the possible de-motivation of traditional craftsmen if they are not adequately recognised. The mission understood that a separate fire prevention strategy has been developed, but this was not made available to the mission. A revised Management Plan 2011-2015 was launched on 27 January 2011. This Management Plan clearly stipulates the overall management structure of the site, the roles and responsibilities of the key stakeholders and reflects the change in focus and approach in reaction to the fire destructions. In order to address the complexities of the re-building process, an amended management system will be put in place during 2012, by the newly appointed site manager. The revised management plan aims to reinforce the role and status of traditional custodians and the mission hopes that they will now be rewarded more appropriately according to their level of involvement and responsibility. The reconstruction process has also drawn attention to the overall conservation of the property and the need for improvements of other buildings, fences and the landscape in general. The mission noted that the overall state of conservation of the property was poor. It also expressed concern that the Drum House and the Dress House that have recently been reconstructed do not reflect the key aspects of Ganda architecture. These have been constructed around a tall concrete cylinder, raised on plinths, and with steep thatched roofs that do not sweep down to almost ground level as in traditional structures. Not only do these roofs break with tradition, but they also render maintenance by thatchers much more difficult. Most of the other buildings in the inner courtyard (apart from the Gate House) bear little resemblance to traditional Ganda architecture and this creates severe vulnerabilities for the authenticity of the overall ensemble. The mission noted that the strategy foresees the preparation of an overall Master Plan for the whole property. A budget that has been drawn up for the reconstruction includes the rehabilitation of the Gate House, improvements at the Royal Drum House, the renovation of 15 other houses, the provision of a permanent water supply (crucial for fire-fighting equipment), and improvement of drainage and sewage systems. The mission notes that threats to the property from commercialisation of some 40 acres of its land had apparently been averted. It considered that it was essential that future development strengthen the cultural attributes of the property in order to preserve its integrity. Overall, the mission concluded that sufficient progress has been made to allow the State Party to start site preparation and emergency works and that the revised Strategy, together with the revised reconstruction drawings, the updated Action Plan, the appointment of a Site Manager and an overall Management structure, are the pre-conditions necessary to lead to a satisfactory reconstruction of the Muzibu Azaala Mpanga. However, further phases of reconstruction need to be based on approved detailed plans and drawings. The mission acknowledged the pressure from many stakeholders for the work to be undertaken as quickly as possible in order to re-enclose the sacred spaces. However, this need must be balanced against the need for a reconstruction that sustains the Outstanding Universal Value. The World Heritage Centre and the Advisory Bodies welcome the detailed revised Reconstruction Strategy that can form the basis for the overall reconstruction project, and the way it has been developed in full consultation with all the key stakeholders. They note that the fire has increased attention to the overall conservation of the property, and has heightened awareness of the fundamental link between the buildings and the intangible heritage related not just to religious ceremonies, but also to traditional knowledge of building materials and practices. This leads to an emerging interest in reviving traditional knowledge and skills, particularly amongst the younger members of the Baganda clans. It has become clear that the whole success of the reconstruction project relies on skilled craftsmen. Fortunately a few still exist, particularly the master thatcher who has been practising for over 40 years and his apprentices, but there is need for capacity building for builders and decorators in order to foster and pass on skills to the younger generations. What is still lacking is an overall research programme to document the building traditions of the other remaining tombs in Baganda and this needs to be organised as soon as possible in order to inform the project. The World Heritage Centre and the Advisory Bodies wish to highlight however, that the prevention of fire, which is the main disaster risk for the property, needs to be given a higher profile. The reconstruction strategy for the Muzibu Azaala Mpanga should include an effective and appropriate fire protection system, based on the best advice from a professional with experience in fire protection for cultural heritage, structures of timber and thatch construction. In addition, a fire protection strategy for the whole property including any necessary retrofitting of existing structures should be developed. The World Heritage Centre and the Advisory Bodies note that the tragedy of the fire has focused attention on the overall conservation and management of the property and highlighted threats to its integrity and authenticity through lack of monitoring and maintenance and through the development of inappropriate new buildings. The greatest threat, however, could come from plans dating back to before the fire to sell off or commercialise some 40 acres of the site. It is understood that these have now been suspended. The World Heritage Centre and the Advisory Bodies consider that there needs to be a declared commitment from the State Party not to sell off part of the property for commercial development, and furthermore to ensure the conservation of the farmland as an attribute of the Outstanding Universal Value. They also stress the need for the Master Plan to address the need to protect the integrity of the whole property and for this to be developed as soon as possible. The World Heritage Centre and the Advisory Bodies note that the reconstruction project has brought about the need to re-focus the management of the property and welcome the revision of the Management Plan and the appointment of a site Manager as an opportunity to introduce a strengthened management system that acknowledges the key role of craftsmen. The World Heritage Centre and the Advisory Bodies recommend that the Reconstruction Strategy should be adopted as the basis for the reconstruction project, with two provisos that a detailed fire prevention plan be presented to the World Heritage Centre for review by the Advisory Bodies before work commences, and that the strategy includes a research and documentation project on the traditional building methods of other Gandan tombs. They are of the view that the site clearance and the emergency works that are subject of an Emergency Assistance request can now commence. These include securing the boundary and building site and putting in place fire protection systems, subject to approval of detailed plans. They also recommend that the World Heritage Committee request the State Party to submit further detailed plans to the World Heritage Centre, together with the overall Master Plan, for review by the Advisory Bodies.